In my title I make a bold claim about how important this book is, but bare with me and all will make sense soon enough. I am guessing there are a lot of you out there who are unfamiliar with the works of Edward W Robertson, unlike some authors he has not made award winning films or TV shows and he does not make huge social media splashes, not that I am complaining about those that do. I watch Game of Thrones and follow Victoria Aveyard (The Red Queen) online, it’s nice just to see someone like Robertson quietly work away churning out these amazing stories. 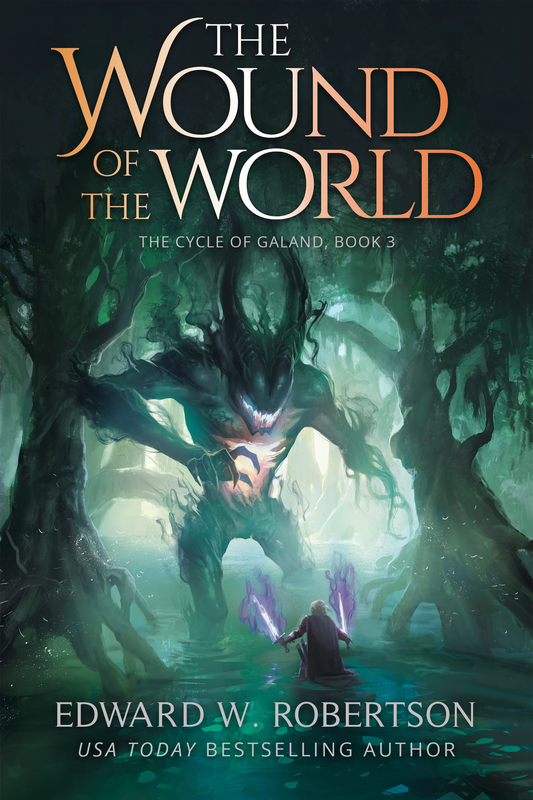 The stories that have drawn me in most are those of The Cycle of Arawn and its follow up series The Cycle of Galand. Though fantasy novels these 6 books touch on many topics that are either timeless or very true to the world we live in today, combining it with a unique world, witty dialogue and some of the most deep yet fun characters I have ever had the joy of following. The series follows Dante Galand a teenager in the first novel and follows his progress through a holy order dedicated to a God who is banned in his homeland. Saying much more than that would only lead to a lot of spoilers. Along the way he gains a life long friend in the form of Blay’s Buckler, his cheeky swashbuckling partner in crime. Their friendship is one of the major driving forces in the books, which is nice because for the most part the book deals with platonic relationships but the major theme of these books, at least in my eyes is faith and how dangerous it can be. Our heroes eventually come to the city of Narashtovik, the Dead city, one that gained its name by being constantly attacked and pillaged for its beliefs and values, beliefs that are not that different from its neighbours. Dante himself becomes a leader within his religion but constantly questions it and never blindly follows it, even when he finds answers to hard questions he ponders on how best to reveal it to his followers, stating that they wouldn’t be ready. Our antagonists are always filled with doubt but the faith in what they believe always spurns them on to commit these heinous acts. Even some of Dante’s allies commit terrible acts because of faith, to me the books show us a simple truth, faith is important, so important we as people need to listen to our brains and sometimes take a step back and watch what we are doing. It’s easy to do the wrong and stupid thing especially if we have started out with good intentions, very much a blink and you would miss it scenario. As for the other reason why this book is so damn important, well that comes in the final third of the book. This is information and how an over saturation of truths can hide what is real from even the most sensible person. To set up the context here our heroes come to a nation that actively encourages its people to argue, coming from the viewpoint that constant arguing will eventually bring out the truth. This allows its government to enforce brutal laws and taxes upon its citizens, because if everyone is busy arguing then no one is able to do anything about it. 2017 has become picked up the torch of previous years and politics are becoming more tribal than ever before, we may not have double speak just yet but we now live in a world of Alternative facts where politicians can say and do as they please with little to no consequences, because we the people are too busy arguing over pointless tribes, tribes that don’t even care about us, all the while a few us scramble to reach the top, those that do are often kicked backed down while the few that reach the heights of glory and held up as proof that we too could achieve greatness. An excellent series whose depth continues to blow me away, I cannot praise these books nearly enough.